Leo constellation lies in the northern sky. It is one of the zodiac constellations and one of the largest constellations in the sky. Leo represents the lion and is usually associated with the Nemean lion in Greek mythology. Its symbol is ♌. The constellation was first catalogued by the Greek astronomer Ptolemy in the 2nd century, along with all the other constellations of the zodiac. Leo is the 12th largest constellation in size, occupying an area of 947 square degrees. It is located in the second quadrant of the northern hemisphere (NQ2) and can be seen at latitudes between +90° and -65°. The neighboring constellations are Cancer, Coma Berenices, Crater, Hydra, Leo Minor, Lynx, Sextans, Ursa Major and Virgo. Leo contains five Messier objects: Messier 65 (M65, NGC 3623), Messier 66 (M66, NGC 3627), Messier 95 (M95, NGC 3351), Messier 96 (M96, NGC 3368), and Messier 105 (M105, NGC 3379). It has 11 stars with known planets. Leo belongs to the Zodiac family of constellations, along with Aries, Taurus, Gemini, Cancer, Virgo, Libra, Scorpius, Sagittarius, Capricornus, Aquarius and Pisces. The brightest star in Leo is Regulus, Alpha Leonis, with an apparent magnitude of 1.35. There are two meteor showers associated with the constellation. The Leonids usually peak on November 17-18 every year and have a radiant near the bright star Gamma Leonis. The January Leonids are a minor shower that peaks between January 1 and 7. Leo is one of the oldest constellations in the sky. Archaeological evidence suggests that Mesopotamians had a constellation similar to Leo as early as 4000 BC. The Persians knew the constellation as Shir or Ser, Babylonians called it UR.GU.LA (“the great lion”), Syrians knew it as Aryo, and the Turks as Artan. Babylonians knew the star Regulus as “the star that stands at the Lion’s breast,” or the King Star. Both the constellation and its brightest star were well-known in most ancient cultures. The Greeks associated Leo with the Nemean lion, the beast killed by Heracles during the first of his twelve labours. Both Eratosthenes and Hyginus wrote that the lion was placed among the constellations because it was the king of beasts. The lion lived in a cave in Nemea, a town located to the south-west of Corinth. It was killing the local inhabitants and could not be killed because its skin could not be pierced by any weapons. Regulus, Alpha Leonis, is the brightest star in Leo and the 22nd brightest star in the sky. It has an apparent magnitude of 1.35 and is approximately 77 light years distant. Regulus is a four-star system composed of two pairs of stars. Regulus A is a spectroscopic binary star composed of a blue-white main sequence star belonging to the spectral class B7 V, and a companion star which cannot be resolved, but is believed to be a white dwarf. The two stars complete an orbit around their common centre of mass every 40 days or so. Regulus B and Regulus C share a common proper motion. They are located at an angular distance of 177 arc seconds from Regulus A. They are dimmer main sequence stars with an apparent magnitude of 8.14 and 13.5. Regulus B is a K2V star and the companion is believed to belong to the spectral class M4V. The two stars are separated by about 100 astronomical units and have an orbital period of 2,000 years. The primary star of Regulus A is a young star, only a few million years old, and has 3.5 times the mass of the Sun. The star is an extremely fast rotator, with a rotation period of only 15.9 hours. As a result, it has an oblate shape. If it were rotating 16% faster, the centripetal force provided by the star’s gravity would not be enough to hold the star together. Alpha Leonis is the closest bright star to the ecliptic. For this reason, it is regularly occulted by the Moon and, rarely, by Mercury and Venus. In the northern hemisphere, Regulus is best seen in the evening in the late winter and spring. The only time of year when the star can’t be seen is for a month on either side of August 22, when it lies too close to the Sun. Denebola is the second brightest star in Leo and the 61st brightest star in the sky. It is a main sequence star with the stellar classification A3 V. It has an apparent magnitude of 2.113 and is approximately 35.9 light years distant from Earth. The star can easily be seen without binoculars. Denebola has 75% more mass than the Sun, 173% of the solar radius, and is 12 times more luminous. It is classified as a Delta Scuti variable, which means that its brightness varies slightly over a period of a few hours. Denebola exhibits variations in luminosity of 0.025 magnitudes about ten times a day. Beta Leonis is a relatively young star. Its estimated age is less than 400 million years. Like Regulus, Denebola is a rapid rotator, which results in an oblate shape of the star, with a bulge at the equator. The star’s projected rotational velocity is 128 km/s. Denebola also exhibits a strong infrared excess, which suggests that it may have a circumstellar debris disk of dust in its orbit. The star belongs to the IC 2391 supercluster, a stellar association whose member stars share a common motion through space, but are not gravitationally bound. Other stars that belong to this association are Alpha Pictoris in the constellation Pictor, Beta Canis Minoris in the constellation Canis Minor, and the stars in the open cluster IC 2391, also known as the Omicron Velorum Cluster, located in the constellation Vela. Gamma Leonis is a double star in Leo. Its traditional name, Algieba or Al Gieba, comes from the Arabic Al-Jabhah, which means “the forehead.” The star is sometimes also known by its Latin name, Juba. Algieba is composed of a giant star with the spectral classification K1-IIIbCN0.5 and a dimmer companion star which belongs to the spectral class G7IIICN-I. The brighter giant is 180 times more luminous than the Sun and has an apparent magnitude of 2.28. The G7 class star has a visual magnitude of 3.51, is 50 times brighter than the Sun, and has 10 times the solar diameter. The two stars have an orbital period of 500 years. A planet was discovered in the orbit of the primary star in November 2009. The Gamma Leonis system has a combined apparent magnitude of 1.98 and is approximately 130 light years distant from the Sun. It is easy to observe in a small telescope under good conditions and appears as a bright double star with orange red and greenish yellow components. Algieba, Adhafera (Zeta Leonis), and Al Jabbah (Eta Leonis) are sometimes collectively known as the Sickle. Zosma, Delta Leonis, is another rapid rotator in Leo, with a projected rotational velocity of 180 km/s. Like Regulus and Denebola, Zosma has an equatorial bulge and an oblate shape. Zosma is a white main sequence star of the spectral type A4 V, approximately 58.4 light years from Earth. It has a visual magnitude of 2.56. Delta Leonis is slightly larger and hotter than the Sun. It has 214% of the solar radius and is about 15 times more luminous than the Sun. In about 600 million years, it will become a red giant. The star is suspected to be a member of the Ursa Major Moving Group, a group of stars that includes most of the brightest stars in Ursa Major that share a common origin and motion through space. The star’s traditional name, Zosma, comes from ancient Greek and means “the girdle.” Zosma is located on the lion’s hip. Theta Leonis is another white main sequence star. It has the stellar classification A2 V and a mass 2.5 times that of the Sun. The star is visible to the naked eye. It has an apparent magnitude of 3.324 and is approximately 165 light years distant from the solar system. Theta Leonis has an estimated age of 550 million years, which means that it is much younger than the Sun. It exhibits an excess emission of infrared, which indicates the presence of a circumstellar disk of dust. The star has a relatively high projected rotational velocity, 23 km/s. The star is sometimes known by its traditional names Chort (from the Arabic al-kharāt or al-khurt, which means “small rib”), Coxa (Latin for “hip”) and Chertan (from the Arabic al-kharātān, meaning “two small ribs”). Kappa Leonis is a binary star with an apparent magnitude of 4.46, approximately 210 light years distant from the solar system. Its traditional name, Al Minliar, comes from the Arabic Minkhir al-Asad, which means “the muzzle of the lion.” The star has the stellar classification K2III. Omicron Leonis is a double star in Leo. It is approximately 135 light years distant. It is sometimes known by its traditional name, Subra. The two components in the Omicron Leonis system belong to the spectral classes F9III (a giant) and A5mV (a main sequence star). They have a combined apparent magnitude of 3.53. Eta Leonis is white supergiant belonging to the spectral class A0 Ib. It has an apparent magnitude of 3.511 and is approximately 2,000 light years distant from Earth. While it appears relatively dim to the naked eye, the star is 5,600 times more luminous than the Sun and has an absolute magnitude of -5.60. The star is suspected to be a part of a binary system. Zeta Leonis has a visual magnitude of 3.33 and is about 274 light years distant from the solar system. It is 85 times more luminous than the Sun. The star has an optical companion, 35 Leonis, which has an apparent magnitude of 5.90. 35 Leonis is located 325.9 arc seconds away from Adhafera and it is only a line-of-sight companion, as it is only 100 light years distant from Earth. Epsilon Leonis is a bright giant of the spectral type G1 II. It has a visual magnitude of 2.98 and is the fifth brightest star in the constellation Leo. Its estimated age is 162 million years. The star is approximately 247 light years distant from Earth. Rho Leonis is another binary star in Leo. It has a visual magnitude of 3.856 and is approximately 5,000 light years distant. Rho Leonis has the stellar classification B1 lab, which means that it has reached the supergiant stage of its evolution. It has 21 times the Sun’s mass, 37 times the radius, and it is about 295,000 times more luminous. Rho Leonis is a runaway star and has a peculiar velocity of 30 km/s at the minimum relative to the nearby stars. The primary component in the system, the blue supergiant, has a companion located at an angular separation of 0.11 arc seconds. The companion star has an apparent magnitude of 4.8. Iota Leonis is a spectroscopic binary star with the stellar classification F3 V. It has a visual magnitude of 4.00 and is approximately 79 light years distant from the Sun. The components in the system are too close together to be able to resolve through a telescope. Sigma Leonis is a blue-white star belonging to the spectral class B9.5Vs. It has an apparent magnitude of 4.044 and is approximately 210 light years distant. Wolf 359 is a red dwarf with the stellar classification M6.5Ve. It has an apparent magnitude of 13.54 and is only 7.78 light years distant. Despite its proximity to the Sun, Wolf 359 can only be seen through a large telescope. It is one of the lowest-mass stars ever discovered, as well as one of the faintest. It emits only about 0.1% of the Sun’s energy, has 8% of the Sun’s mass, and only 16% the solar radius. The star has an estimated age of less than a billion years. It has a relatively high proper motion. Wolf 359 is classified as a flare star, one that can undergo dramatic increases in luminosity for several minutes as a result of magnetic activity on its surface. The flares from the star emit strong bursts of gamma rays and X-ray radiation. Wolf 359 is one of the nearest stars to the Sun. Only Alpha Centauri in the constellation Centaurus and Barnard’s Star in Ophiuchus are closer. Because of its proximity to Earth, the star is often mentioned in works of fiction. Star Trek fans will recognize it as the location of the Battle of Wolf 359, in which the Borg, led by the assimilated Captain Picard, obliterate the Starfleet ships, leaving few survivors, among them Benjamin Sisko, the future captain of Deep Space Nine. The star was also famously mentioned in an episode of The Outer Limits. Gliese 436 is another red dwarf located relatively close to the Sun. It has a visual magnitude of 10.67 and is 33.1 light years distant. It belongs to the spectral class M2.5 V.
An extrasolar planet, Gliese 436b, was discovered in the star’s orbit in 2004, and the presence of another planet, UCF-1.01, was confirmed in 2012. CW Leonis is a carbon star embedded in a thick envelope of dust. It is between 390 and 490 light years distant from the Sun. The star was first discovered in 1969 by the American astrophysicist Eric Brecklin and his team of astronomers. CW Leonis is at a late stage of its evolution, blowing off its outer layer to eventually become a white dwarf. The gaseous envelope, rich in carbon, is some 69,000 years old and the star is losing an enormous amount of mass each year. Its extended envelope is believed to have at least 1.4 solar masses of ejected material. The star exhibits variations in brightness over a period of 649 days. It has a nominal luminosity of 11,300 times that of the Sun, but this varies over the course of the pulsation cycle, from 6,250 to 15,800 times the Sun’s luminosity. Consequently, its apparent magnitude varies too, ranging from 1.19 to 10.96. R Leonis is a red giant star of the spectral type M8IIIe. It has a visual magnitude varying from 4.4 to 11.3 with a period of 312 days and is classified as a Mira variable. Mira variables are pulsating variable stars that are in the late stage of evolution, very red in colour, and with pulsation periods longer than 100 days. They eventually expel their outer envelopes to form planetary nebulae and become white dwarfs within a few million years. R Leonis is approximately 370 light years distant from the solar system. When it is at its brightest, it can be seen without binoculars, and when it is on the dimmest end of the spectrum, one needs at least a 7 cm telescope to see the star. R Leonis has a radius 320-350 times solar. 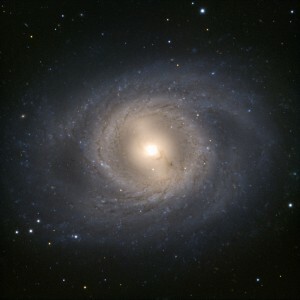 Messier 65 is an intermediate spiral galaxy in Leo. It has an apparent magnitude of 10.25 and is approximately 35 million light years distant. The galaxy was discovered by Charles Messier in 1780. Messier 65, Messier 66 and NGC 3628 form the famous Leo Triplet galaxy group. The galaxy does not contain much dust and gas and there isn’t much star formation occurring in it. Most of the stars in the galaxy are old. M65’s disk appears slightly warped, which, along with some recent starburst activity, suggests that the galaxy is interacting with another object. 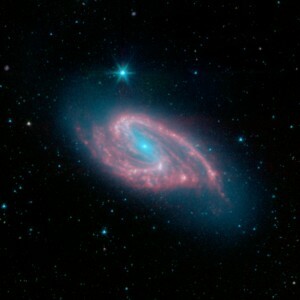 Messier 66 is an intermediate spiral galaxy in Leo. Charles Messier discovered it in 1780. This image of spiral galaxy NGC 3627, also known as Messier 66, was captured by the Spitzer Infrared Nearby Galaxy Survey (SINGS) Legacy Project using the telescope’s Infrared Array Camera (IRAC). NGC 3627 is estimated to be 30 million light-years distant and seen towards the constellation Leo. Astronomers suspect that the galaxy’s distorted shape is due to its ongoing gravitational interactions with its neighbors Messier 65 and NGC 3628. The galaxy has a visual magnitude of 8.9 and is about 36 million light years distant. M66 is approximately 95,000 light years across and notable for its dust lanes and bright star clusters. 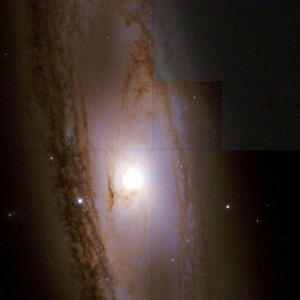 It is part of the Leo Triplet, along with M65 and NGC 3628. M66 and NGC 3628 had an encounter in the past, and the gravitational interaction between the two resulted in an extremely high central mass concentration in M66, a high molecular to atomic mass ratio, and a resolved noncorotating clump of H I material being removed from one of M66’s spiral arms. Messier 95 is a barred spiral galaxy in Leo. It has a visual magnitude of 11.4 and is approximately 38 million light years distant. 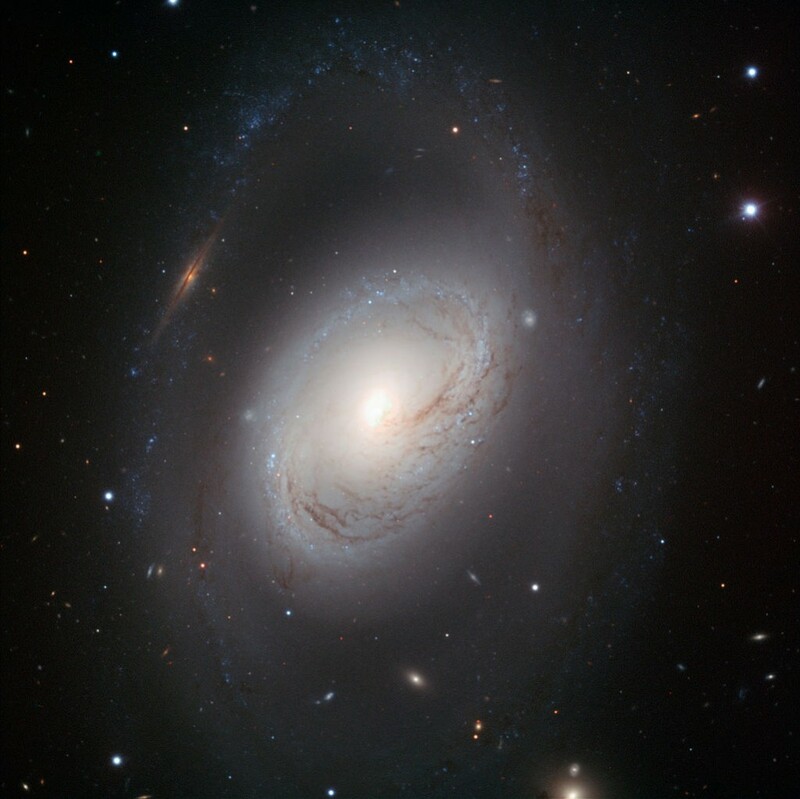 The galaxy Messier 95 stands boldly face-on, offering an ideal view of its spiral structure. The spiral arms form an almost perfect circle around the galactic centre before they spread out, creating a mane-like effect of which any lion would be proud. The central region of M95 has a ring-shaped starburst region around the core with a diameter spanning about 2,000 light years. The galaxy was discovered by the French astronomer Pierre Méchain in 1781 and Charles Messier subsequently included it in his catalogue four days later. M95 belongs to the M96 Group of galaxies, which also includes M96 and M105, and also at least nine other galaxies. A supernova was observed in M95 in March 2012. Messier 96 is another intermediate spiral galaxy in Leo constellation. It has an apparent magnitude of 10.1 and is about 31 million light years distant. M96 is the brightest galaxy in the M96 Group. It was discovered by Pierre Méchain on March 20, 1781 and then included in Messier’s catalogue a few days later. The galaxy is classified as a double-barred spiral with a small inner bulge through the centre along with an outer bulge. Ultraviolet emissions from the galaxy’s central region suggest that it has a supermassive black hole at its core. A Type Ia supernova, SN 1998bu, was discovered in M96 in May 1998. Messier 105 is an elliptical galaxy in Leo. It has a visual magnitude of 10.2 and is approximately 32 million light years distant. The galaxy is known to have a supermassive black hole at its centre. M105 was discovered by Pierre Méchain in March 1781, a few days after he had first observed M95 and M96. NGC 3628 is an unbarred spiral galaxy approximately 35 million light years distant from the solar system. It was discovered by William Herschel in 1784. 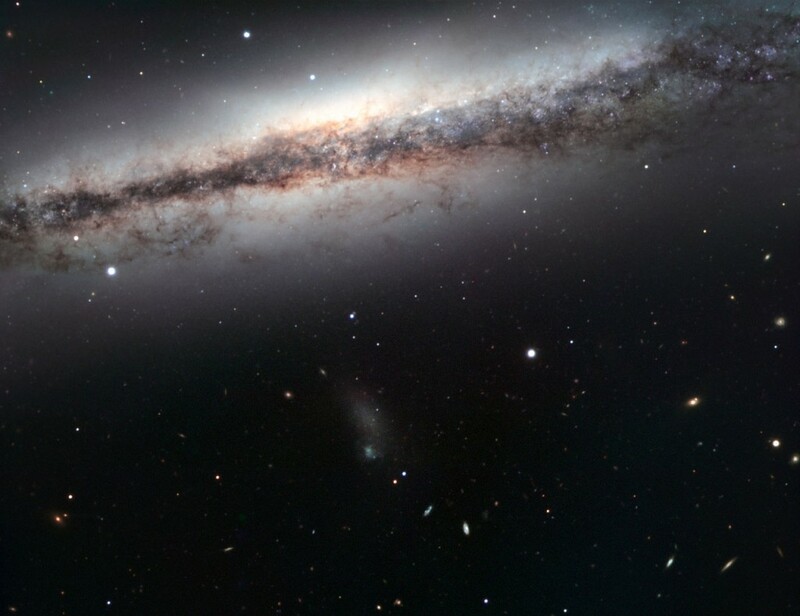 The galaxy is notable for having a long tidal tail spanning about 300,000 light years, and a broad, obscuring dust band along the outer edge of its spiral arms. Along with Messier 65 and Messier 66, NGC 3628 forms the Leo Triplet galaxy group. The Leo Ring is an enormous primordial cloud of hydrogen and helium found in orbit of two galaxies in the Leo constellation. The cloud was discovered by radio astronomers in 1983. 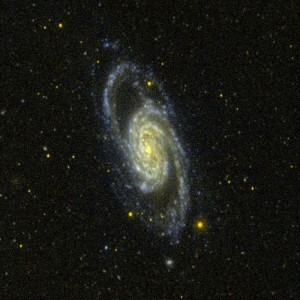 NGC 3607 is a spiral galaxy in Leo. It has a visual magnitude of 10.8 and is a member of the Leo II Group (NGC 3607 Group) of galaxies. NGC 3593 is a spiral galaxy in Leo. It has an apparent magnitude of 12.6. NGC 3384 is an elliptical galaxy, approximately 35.1 million light years distant. It was discovered by William Herschel in 1784. The stars located in the galaxy’s central region are very old. More than 80% of them are Population II stars, more than a billion years old. NGC 3384 belongs to the M96 Group (Leo I Group) of galaxies. NGC 3842 is an elliptical galaxy, notable for having one of the largest black holes known. The black hole at the centre of the galaxy is believed to have a mass of 9.7 billion solar masses. The galaxy has an apparent magnitude of 12.8 and is approximately 331 million light years distant from Earth. NGC 3596 is an intermediate spiral galaxy with a visual magnitude of 12.0. It was discovered by William Herschel in 1784. The galaxy can be found below the bright star Theta Leonis. NGC 2903 is a barred spiral galaxy. It has a visual magnitude of 9.7 and is approximately 30.6 million light years distant from the Sun. The galaxy was discovered by William Herschel in 1784. NGC 3626 is a medium-tightness spiral galaxy in Leo. It has a visual magnitude of 10.6/10.9. The galaxy lies in the vicinity of the bright star Delta Leonis (Zosma). It is approximately 70 million light years distant. The galaxy belongs to the NGC 3607 Group, one of the many Leo II groups of galaxies. NGC 3357 is an elliptical galaxy in Leo. It was discovered by the German astronomer Albert Marth on April 5, 1864.